Nokia 9 had appeared on the internet with the colour Polished Copper, but the latest leak shows that Nokia's flagship phone will be present in Polished Blue colour. The colour is said to be almost similar to Nokia 8. 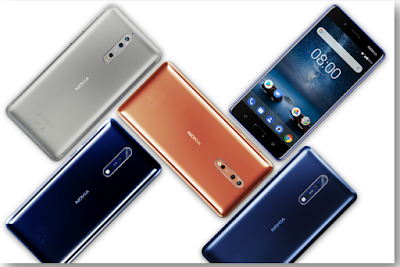 Nokia 9 colours Polished Blue design looks similar to Polished Copper colour design. As for other devices such as the Lumia 930 which was released in 2014 and is shown featuring a matching colour called by the Nokia as a variant of Bright Orange colour. Nokia 9 body adopts a curved design with a glass bandage the screen looks to follow the curve of the screen that leads to the rear. As for the glass layer that wrapped the back of the body also looks curved to follow the curve that leads to the front. The front and back curves of the device body then meet on an aluminium frame material. The upper and lower bezel of the smartphone though a bit thin but can not be said super thin like the trend of bezel-less that exist in today's smart phones. Its dual rear camera is vertically designed with an LED flash flanking it to the right. Just below the photograph is embedded a circular fingerprint scanner sensor. Nokia 9 is expected to come with Snapdragon 835 mobile platform, 6 GB / 8 GB RAM and up to 128 GB of storage. The phone is also rumoured to be equipped with IP68 certificate and wireless charging support. Nokia 8 reportedly will be priced at 877 USD or Rp. 11.8 millions. Unfortunately, HMD Global has not announced when this device will be launched although it is predicted to fall in the fourth quarter of this year.